As the EPA pushes for fuel mileage for all vehicles, the builders of diesel powered trucks are working hard for better MPG. Part of this is new standards for engine oils. 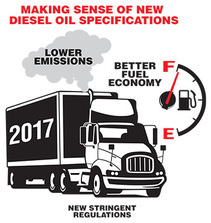 Driven by federal regulations that raise the bar for fuel economy while lowering emission limits, modern diesel vehicles produce more horsepower and torque than ever, run much hotter, operate under higher pressures and have the ability to burn up to 20 percent biodiesel. These advances place new demands on diesel oil, in addition to demands for increased protection from those who depend on diesel power to make a living.